I picked 6 pounds of blueberries recently and have been busy trying to use them up before we head back to Umbria this coming weekend. I decided to make some healthy muffins one day, using a combination of whole wheat and oat flour, low fat buttermilk, and light olive oil. 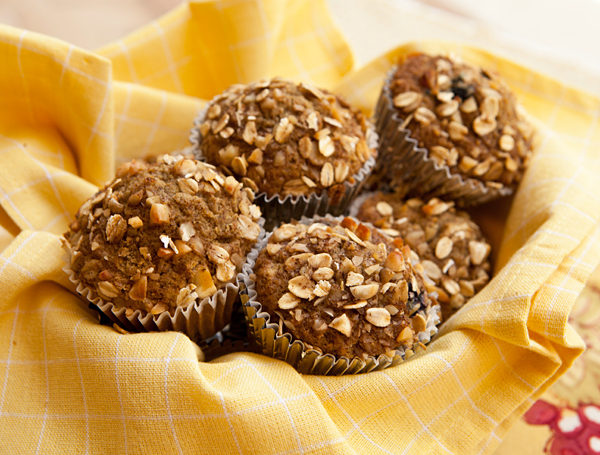 I topped my muffins with a combination of chopped almonds and rolled oats which added some texture in every bite. These muffins turned out really well, and although I used blueberries, any type of berry would work out well. This recipe makes 14 to 16 medium sized muffins, or 12 large ones. If you cannot locate oat flour, you can easily make it yourself by processing rolled oats in a food processor until finely ground. A moist blueberry studded muffin that is great for breakfast or any time of the day. Preheat oven to 375 degree F and line muffin tin with muffin papers. Mix together the flours. sugar, cinnamon, baking soda, baking powder, and salt in a bowl. In a separate bowl, mix the buttermilk, oil, eggs, and extract and blend together with a whisk. Add the wet ingredients to the dry and stir just until mixed. Toss together the blueberries and 2 tablespoons of flour, then stir the berries into the batter. Mix together the topping mixture, then sprinkle over the top of the muffins. Bake for 20 to 25 minutes or until firm when touched.